The Kurdish question is one of the most complicated and protracted conflicts of the Middle East and will never be resolved unless it is finally defined. The majority of the Kurdish people live in Turkey, which gives the country a unique position in the larger Kurdish conundrum. Society in Turkey is deeply divided over the definition and even existence of the Kurdish question, and this uncertainty has long manifested itself in its complete denial, or in accusations of political rivals of ‘separatism’ and even ‘treason’. Turkey’s Kurdish Question explores how these denial and acknowledgement dynamics often reveal pre-existing political ideology and agenda priorities, themselves becoming political actions. While the very term “Kurdish question” is discussed in the academic literature as a given, a new and systemic study is required to deconstruct and analyze the constitutive parts of this discursive construct. 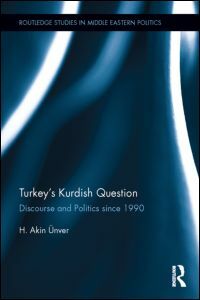 This book provides the first comprehensive study and analysis of the discursive constructions and perceptions of what is broadly defined as the “Kurdish question” in Turkish, European and American political cultures. Furthermore, its new methodological approach to the study of discourse and politics of secessionist conflicts can be applied to many similar intra-state conflict cases. Turkey’s Kurdish Question would suit students and scholars of Middle East studies, Conflict studies and Comparative Politics, as well as Turkish or Kurdish studies. H. Akin Ünver is an assistant professor of international relations at Kadir Has University. This book is based on his dissertation ‘Defining Turkey’s Kurdish Question‘, which has won the Middle East Studies Association (MESA) 2010 Malcolm H. Kerr award for the best dissertation in the field of social sciences.